This page will be updated weekly through November. 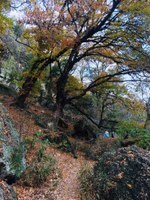 For more fall foliage photos, check out Lost Maples on Facebook. Saturdays, Sundays and holidays in the fall are very busy. Come see us during the week to avoid the crowds. When parking lots are full, the Natural Area will close for the rest of the day. Please arrive early and have a back-up plan in case we are closed. We cannot make appointments or res­er­va­tions for day use. People with camping res­er­va­tions will be able to enter during these capacity closures. Check our Facebook page for closure updates. Call (830) 966-3413 for more information. Yellow seems be our color this year no matter how much we wished for brilliant reds and oranges. Nature is nature. The park will be open normal hours during the Thanksgiving holiday but expect long wait times and closures due to capacity. Please be patient with our staff as we do our best to accommodate each and every park visitor. We would also like to wish everyone a wonderful Thanksgiving filled with family, friends, food, and a chance to get outside. 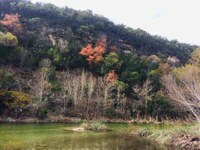 Thank you for loving our natural area and supporting TPWD. Life’s better outside. TPWD photos taken on Nov. 20, 2018. 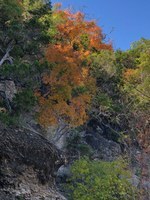 This has not been a banner year for leaf color here at Lost Maples. Abundant rainfall in September and October has proven to be too much for our Maples to successfully show off their colors. 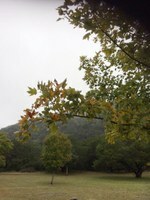 Many trees along the trails have already dropped their leaves, whereas the trees in the day use area, park office and campground may peak in a couple of days, thanks to a cold front that moved in this week. Although the color hasn’t been our best, the park itself hasn’t looks great. All the creeks, streams, the pond and river, are full of crystal clear water, adding to the beauty of the trails. Remember, the next couple of weeks will be busy times, especially this weekend and the Thanksgiving holiday. Expect wait times, closures due to capacity, and small crowds along the trails. 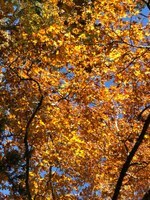 The park office is open everyday, even Thanksgiving Day, from 8 a.m. - 4:30 p.m. Cost is $6 per person, for anyone 13 years old and over. 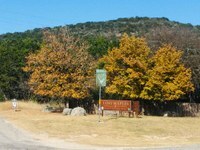 TPWD photos taken on Nov. 14, 2018. 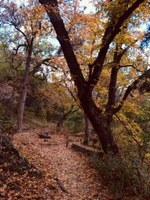 Fall has definitely hit the canyon. 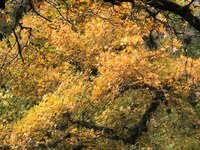 We are seeing reds, oranges and yellows, lots of running water and paths lined with an array of colored leaves. A cool front is headed our way, promising lower temperatures for the feel of fall. 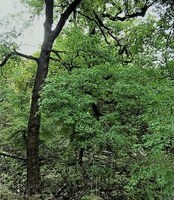 TPWD photos taken on Nov. 7, 2018. 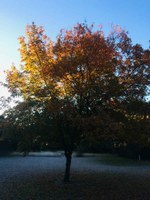 The leaves have finally gotten the message that Fall is here! 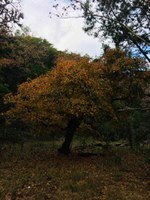 We are starting to see lots of color – yellow, red, brown and still some green. Park visitor Kimberly L was gracious enough to share her recent photos so you can see for yourself. Photos taken on Oct. 27, 2018, by park visitor Kimberly L.
Rain, rain go away, bring us some sunshine to brighten our day! 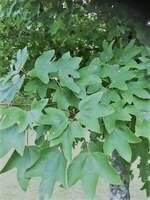 Leaves are showing a slight hint of yellow with the cool nights but the continued rains have not given the Maples the sunshine they so badly need. But don't fret just yet, coming up this weekend, several days of sunshine are in the forecast for the area! 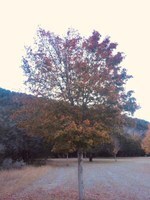 The Lost Maples may dazzle us yet with their multi-color display. Note: The East, East-West and Maples trails are all open but the West and West-Loop trails remained closed for continued cleanup and repair. TPWD photos taken Oct. 24, 2018 by Lisa Fitzsimmons. 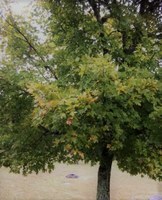 Summer disappeared in a hurry as September ushered in fall with weeks and weeks of much needed rain. 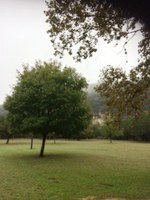 Lost Maples looks like it belongs in Ireland right now, with its lush green grass and flowing springs. 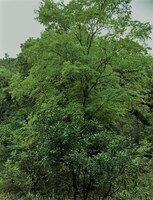 The trees also benefited from the sweet rain and went from the drab of summer heat to lively spring green, with no hint of transforming just yet. 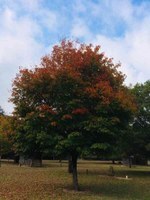 A cool front did move into the area on Oct. 15, with hopes of letting the Maples know it was getting time to dazzle us with their multi-color display soon. TPWD photos taken Oct. 17, 2018 by Lisa Fitzsimmons. Restrooms and picnic tables are wheelchair accessible. 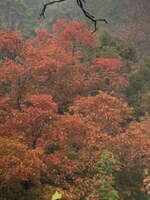 You can drive about one mile into the park to view foliage from your vehicle. 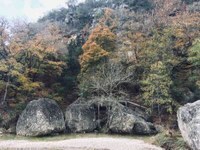 The park is located 86 miles northwest of San Antonio and five miles north of Vanderpool off Ranch Road 187. 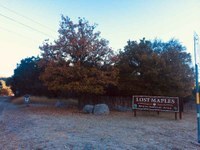 If you need further information, please call Lost Maples at (830) 966-3413. Campsites fill up quickly for the weekends. 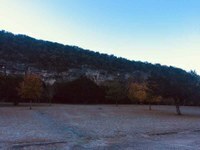 To make reservations or to check on campsite availability, go to the reservations page or call the Customer Contact Center at (512) 389-8900, Monday through Friday, 9 a.m. to 6 p.m.
Get a Texas State Parks Pass and you and your guests will get unlimited free entry to more than 90 Texas state parks for one year!